Alaska State Library, John Grainger Photo Collection, P255-79-79. 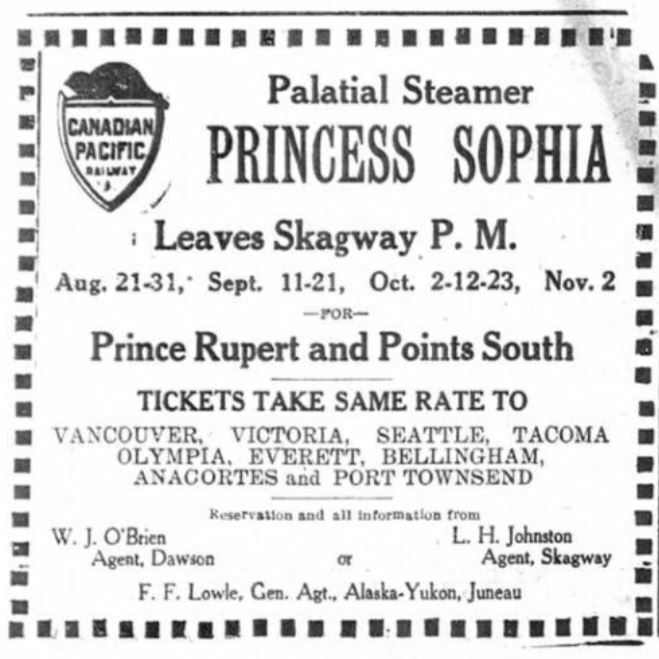 Canadian Pacific liner SS Princess Sophia is sometimes called the Titanic of the West. She ran aground on a reef near the north end of the Inside Passage early in the morning on 24-October-1918. Sometime on the afternoon of the 25th, she sank with all hands. The Canadian Pacific passenger liner Princess Sophia sunk at sometime between 8 o'clock last night and 7 o'clock this morning, and in all probability every one of the 343 souls on board met watery graves in Lynn Canal. The only possibility that some of those on board were saved is the chance that life boats were launched during the night and reached shelter with their human cargoes. This possibility is regarded as remote by those familiar with the storm that was raging all last night in Lynn Canal. "Driven over reef during night. Only masts showing. No survivors." With the King and Winge the Cedar immediately began the search for the passengers -- the living, if any, the dead if none survived. LITTLE HOPE EXISTS THAT ANY LIVE. This afternoon a wireless dispatch says the Cedar had picked up four empty and capsized life boats from the Princess Sophia, and the King and Winge one. The King and Winge had recovered one body, a woman, unidentified. The Princess Sophia ran ashore on Vanderbilt reef, four miles from Sentinel Island, at 2 o'clock Thursday morning. Since that time the weather has been too rough to transfer passengers. Boats have been lying by all the time. Yesterday the storm became terrific. Boats that were lying by sought shelter at night. At 8 o'clock Capt. Locke of the Princess Sophia sent a wireless dispatch to General Agent Lowle which said the passengers' conditions were normal, that the vessel was not taking water, but that it was too rough to transfer passengers. That is the last that was heard from the scene until 7 o'clock this morning when the Cedar, which had been compelled to seek shelter, wired that she was leaving for the Princess Sophia. About two hours later came the fateful wireless dispatch saying that the vessel had sunk and that there were no survivors. The circumstance that the Princess Sophia was blown over the reef leads to the conclusion that the climax of the disaster came at high tide, about 4:30 this morning. The story, of the last hours of the doomed vessel and her hundreds of human souls will probably never be told. The disaster is probably the worst that ever has occurred in northern waters. There seems hardly a chance that a single life has been saved to tell the tale. At 3:20 this afternoon the customs house received a message from the lighthouse tender Cedar that four capsized boats had been picked up. The King and Winge picked up one unidentified body of a woman. The message said the boats were still cruising around Sentinel and Lincoln islands in the hopes of finding some survivors. EVERY AVAILABLE BOAT TO THE RESCUE. Every available boat at Juneau and vicinity has been sent to the scene of the disaster. The Princess Alice will be due here at 8 o'clock, and she will leave immediately. Among those who will leave on the Princess Alice for the wreck will be Gov. Thomas Riggs, Jr.
J. S. Smith, wife and two children. The Canadian Pacific asks for 10 competent volunteer seamen to search the shores and beaches for survivors for the Princess Sophia. They are asked to report at the United States Customs House before six o'clock this evening or after seven o'clock. "Driven over reef during night. Only masts showing. No survivors. Will cruise Lynn Canal to leeward. Blowing strong. No wind with snow. King and Winge assisting." It is believed that the reference to strong wind was that the wind was blowing strong during the night, but this morning that it was snowing and there was no wind. "Steamer Cedar and three gas boats standing by. Unable to take off passengers. Strong northwest wind blowing. Cannot back off reef. Main stenmpipe broken; not taking water. Condition of passengers normal." The Sophia carried a crew of 75 and there were 268 passengers on board. With a number of boats sent from Juneau this morning, the remaining hope is that some of the boats from the Sophia may have been launched during the night allowing some of the passengers at least to escape to the nearby coast. Charles Duffy and Frank O'Brien of the Juneau Ferry & Navigation Co. left for the scene of the wreck on Thursday morning, arriving there at 1 o'clock in the afternoon. The men report bucking a heavy gale for eight hours on their way and on arriving near the wreck found the seas so high that no small boat could get near her. They put behind the Sentinel Island light house and conferred with Light keeper Charles Bohn, who stated that he had kept the glasses constantly on the wreck and up to that time no one had left the ship. Three boats were standing by at the time the Fisherman was behind Sentinel Island, the Amy, Peterson and Estebeth. Having no food or blankets on board, the men left at 4 p. m. for Eagle River. About seven o'clock Thursday night, they report having seen the light house tender Cedar appear, hut nothing else could he seen after that hour owing to the heavy fall of snow. At ten o'clock on Friday morning, the Lone Fisherman started for Douglas, realizing that nothing could be done. They arrived in port at 3 o'clock yesterday afternoon and stated that the storm and seas began getting worse from ten o'clock Thursday morning. They report the snow and storm so blinding on Friday forenoon, that the Lone Fisherman narrowly missed piling up on Portland Island. The captain of the Lone Fisherman said that the seas were over 30 feet high and could not get around Sentinel Island yesterday. The King and Winge was there and could not get around Sentinel Island. Purser -- C. G. Beadle. Chief Engineer -- John Almonds. First Officer -- Frank Gosse. It is believed that the second officer is a man named Murphy, but of this the local agent was not quite certain. Among the passengers was John F. Pugh, collector of United States customs, for Alaska. Boats sent to the scene this morning by Agent Lowle were the Pacific, Sitka. the Hegg, Wilson, Anita Phillips, Apex, Amy, Lone Fisherman and Adolphus. On the scene already were the King and Winge, Excursion, Elinor, Elsinor, Estebeih and the light house tender Cedar. This morning some hope was held out from the fact that during the night the officers may have been able to launch some of the boats and make for the shore. Boats have been instructed to search Auk Bay and all of the surrounding shores for signs of passengers landing. It will probably be late tonight before definite news is heard of the resuit of the searching boats. First aid instruction books were secured from Red Cross headquarters and were sent out on the boats in case of emergency. The two cannery tenders at Auk Bay were notified and asked to leave for the wreck. Dr. A. H. Sargeant and P. H. Bagley. formerly of the United States Hospital Corps left on the Adolphus and will make their headquarters on the Cedar. The Princess Sophia was built at the Fairfield Ship Building Yards in Glasgow. Scotland. Her gross tonnage was 2319 tons; length 245 feet, width 44 ft. and depth 18 ft. The Sophia was a single-screw steamer, burning oil fuel. A. D. Pinska is a brother of M. A. Pinska, the Dawson and Fairbanks merchant. William Scouse is a Hunker Creel mining man who has taken one of the largest fortunes out of the Klondike, and is heavily interested in Seattle and Vancouver real estate. He lives in Seattle during the winter and is a member of the Arctic Club. John Zacacarellis is a Dawson Merchant. M. S. Eades is proprietor of the Royal Alexandria Hotel at Dawson and is heavily interested in Seattle. Vanderbilt reef is located about four miles from the West shore and a little over three miles from the East shore of the mainland on Lynn Canal. North and Benjamin Island are the nearest points of land to this reef. Bridget Cove on the East shore of the mainland and Point Whitney on the west shore are the nearest landing places on the mainland. If it were possible to round Point Whitney, survivors could find a good harbor in St. James Bay. With the prevailing winds and tides all familiar with those waters are of the opinion that the boats or wreckage would first touch on Lincoln Island or be thrown against North and Benjamin Islands. The distance to Vanderbilt reef to Lincoln and Ralston Islands are about the same as to the Sentinel Island light house. Among the passengers were the wife of George Marcus, of the N. C. Company at Fairbanks and daughter Virginia, who were planning to stop off at Juneau and visit with Mr. and Mrs. Ray G. Day. 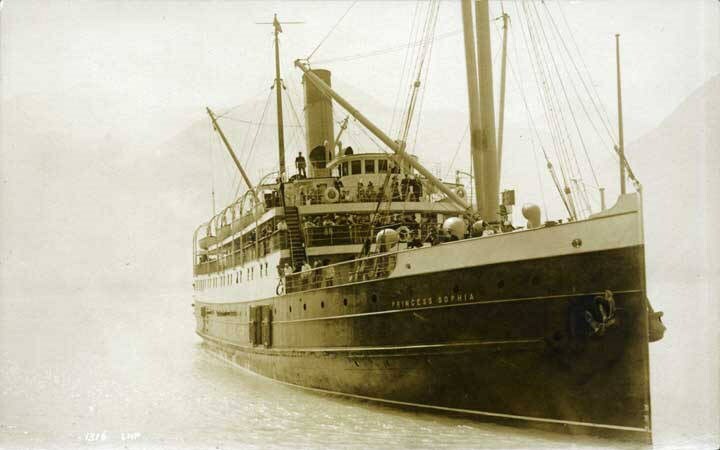 A wire was received from the father of Mrs. Marcus today that he was unable to get passage on the Sophia, but that "Dorris and Virginia were aboard the Sophia." The fishing schooner Monaghan arrived in port at 4 p. m. and reported that they know nothing of the wreck but on passing Lincoln and Shelter Islands saw many pieces of wreckage and the water was covered with oil. J. C. Rathbone, who was in Dawson this summer and stranded in Skagway with a number of the passengers who left there on the Princess Sophia but who secured passage himself on the City of Seattle, identified many on the passenger list of the Sophia. "This disaster wipes many of the best people of the Interior," said Mr. Rathbone. W. J. O'Brien, agent for the Canadian Pacific Railway in Dawson, Mrs. O'Brien and their five children were aboard the boat. D. A. McDonald of Dawson was on his way to Victoria with 18 horses. George Milton, one of the passengers, is manager of the Five Finger coal mine. Capt. J. C. Green of the Yukon, Capt. C. J. Bloomquist of the Dawson, and R. H. Davies, purser of the Dawson, were among the Yukon river boat people on their way South. J. E. Clark is the Clerk of the Court of the Fourth Division at Fairbanks. H. S. Parkins Is manager of a cold storage company at Dawson. E. S. Ironsides is the Collector of Customs at Dawson. He is accompanied by his mother. Mrs. C. J. Vifquian is the wife of the traffic manager of the White Pass at Dawson. Mrs. M. Vary and Miss E. Vary were on their way to Prince Rupert to visit Mrs. Vary's daughter who is with the Grand Trunk office, and her son. who Is farming in Saskatchewan. who had leave until November before leaving for overseas with the Canadian forces. Mr. Lowle said that he received no word from either the Sophia or the Cedar between eight o'clock last night and seven o'clock this morning. The message received from the Cedar at seven o'clock in the morning said that she had sought shelter during the night and that she was leaving for the Sophia. At 8:30 Mr. Lowle received the wireless from the Cedar which brought news of the disaster. It is thought possible that J. E. Clark should be J. A. Clark, the prominent lawyer and member of the firm of Clark and McGowen of Fairbanks. Whereas, death has brought untold sorrow to all Alaskans unable yet to realize the far-reaching effects of the disaster. Therefore. I, Thomas Riggs, Jr.. Governor of Alaska, do request that as a mark of respect to our beloved dead and to the crushed and broken families, all flags in the Territory shall be placed at half mast for a period of three days, that all churches shall conduct memorial services and that each person believing in a just and merciful God, knowing how little and helpless are we all, shall ask for guidance and strength to be of such service as can be given. Given under my hand and the Seal of the Territory of Alaska, in Juneau, the capital, this twenty-sixth day of October, in the year of Our Lord, One Thousand Nine Hundred and Eighteen and of the independence of the United States the One Hundred and forty-second. VANCOUVER. Oct. 26. -- The Princess Alice left here today to get the Sophia's passengers. VICTORIA, Oct. 26. -- The wrecker Tee(? - JT) has left here to assist the Sophia. This ad from a Skagway newspaper lists upcoming sailings, including the one on October 23.